You’re likely to be seeing a lot more of The Orville and Good Trouble. Deadline reports the FOX and Freeform TV shows have each received a tax credit from the state of California. From Seth MacFarlane, The Orville centers on the crew of a mid-level exploratory spaceship, The U.S.S. Orville. The FOX comedy stars MacFarlane, Adrianne Palicki, Penny Johnson Jerald, Scott Grimes, Peter Macon, Halston Sage, J Lee, Mark Jackson, and Chad L. Coleman. The series premieres its second season on December 30th at 8 p.m. ET/PT. Meanwhile, Freeform‘s Good Trouble is a spin-off of The Fosters and follows Callie (Maia Mitchell) and Mariana (Cierra Ramirez) as they move to Los Angeles. The series debuts on January 8th. 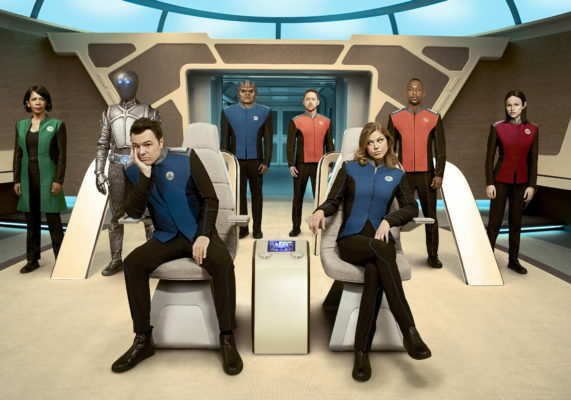 While neither FOX nor Freeform have announced season renewals for The Orville or Good Trouble, the fact that both shows have earned a California tax credit highly suggests there will be a third and second season, respectively. What do you think? Have you seen The Orville? Will you watch Good Trouble? Do you want another season? More about: FOX TV shows: canceled or renewed?, Freeform TV shows: canceled or renewed?, Good Trouble, Good Trouble: canceled or renewed?, The Orville, The Orville: canceled or renewed? Good Trouble: Is the Freeform TV Series Cancelled or Renewed for Season Two? This show reminded me of why I used to watch TV. I just want to be entertained, that’s why I mostly watch my own collection of DVDs. But the Oreville brought me back to broadcast video. Thanks Fox.. keep it up! The Orville is what Discovery wished it was. I have spent more time convincing friends that the Orville is a a serious homage to the original Star Trek series, and not a silly show. The story lines are very interesting and address issues that are very real. The humor is subtle and great. This show feels more real as to what the future if we have one is space will be like. Loving each episode, as it comes out – in my opinion best Star Trek parody and possibly the first one, really.